"Our fabulous bubble bath, shampoo and body wash, 3 in 1, contains a host of soothing nourishment like, Calendula, Chamomile, and Oat which is perfect for cleansing delicate baby skin and hair, as well as adults. Mild and non-irritating it creates a lot of stable long lasting bubbles for the best fun time in the tub. Oatmilk helps relieve Eczema, while Calendula moisturizes and soothes dry skin. This plant-based formula is gentle for pregnant women, and can be used by the entire family." 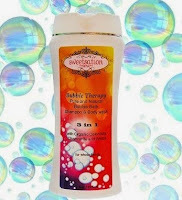 I was sent a 7.5 oz jar of the Bubble Therapy Pure & Natural Bubble Bath from Sweetsation Therapy to review. The price for this bottle is $18.11, plus shipping. This bottle arrived to me in perfect condition. There wasn't any damage, defects, nor issues during shipment. The bottle stands a little over 6.25" tall. It is 2.75" at its base. The bottle itself is very pretty, the label displays a nice yellow to purple gradation with little bubbles on it. The bottle is white, and it has a white flip-top. There is a chrome accent on the lid as well. It was wrapped in tissue paper when I received it, and packaged in exterior bubble wrap. The front of the bottle labels the brand, product, and sizing information. It also lists the main ingredients-- organic calendula, chamomile, and arnica. The safety seal covers the bottle's lid, and it has an 'easy tear' perforated strip. The back label is where you will find all of the important information about this product. It begins with detailed information about this product, directions, and all of the ingredients. There is also a section for warnings associated with this product's use. The lid is a small circular flip-top. It is easy and comfortable to open. Sometimes these types of lids break my nails because they are so tough. Not this one! 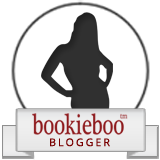 I've tried a few products from this line, and let me tell you-- I love them! A bath tub has always been a nice luxury for me. I've never really been into soaking until recently. I guess with age comes stress, and with stress comes bubble baths. AMIRIGHT!? I was so excited to try this product because Sweetsation Therapy makes amazing products! This wasn't the exception. I've used it three times now (you know, for good measure)... I am really enjoying this bubble bath! Like it says-- it's more of a therapy than a normal run-of-the-mill sudsy-type. The bubble bath is the perfect consistency. It's a yellowish color, and it smells citrus-y. A little of this goes a long way! I flip the bottle over and count 'one-Mississippi', and flip it back over. The bubbles are so uplifting, and it creates such a relaxing ambiance. The bubbles themselves actually last quite a long time, and you get a whole lot of 'em! Creates a relaxing and calming ambiance. The bubbles come easily and last a long time (for me, about 15 minutes). Doesn't dry out your skin after use! I've put all of my other bath products on hold while I have this. This is my favorite bath product to use! It is my favorite fragrance, the bubbles last a long time, and you only need a little bit. This is a very high quality bath product, and it's made for the entire family to use! Are you wanting to try the Bubble Therapy Pure & Natural Bubble Bath, too? Click the link below, and order away!